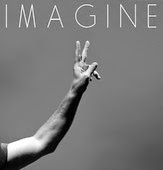 Pearl Jam has released Eddie Vedder's cover of John Lennon's Imagine from his concert in Meco, Portugal on July 18, 2014. Fans of the band's Ten Club received the single as part of their annual holiday single. And on September 30, 2014 it will be available for purchase on Itunes for the public. "Proceeds from sales will go to Heartbeat.fm, an organization that creates opportunities and spaces for young Israeli and Palenstinian musicians to work together, hear each other, and amplify their voices to influence the world around them."